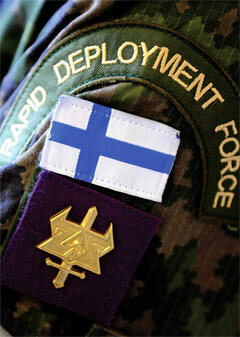 Finland provides a complex and challenging perspective on soldier modernisation. First, though a small country, it fields a large army of 350,000, based around reservists with officers serving for one year with other soldiers serving either six or nine months, depending on their role. The means of equipping these troops is limited; the current military budget for example is just €2.8 Billion with one third of that allocated for procurement programmes, including Warrior 2020. Major Matti Honkela, Programme Manager for Warrior 2020 said, “Because of the limited training time for our reservists we have specialised units for specialised tasks and our units are divided into three.” These are; Main Manoeuvre Forces comprising Operational Brigades and Mechanized Battalions, secondly Territorial forces with both Defending Units and Offensive Units and thirdly Company sized Units for MOUT. Tasks for the Defence Forces are divided into hierarchical priorities, the most important being Homeland Defence followed by aid for other authorities and finally peace support operations. Maj. Honkela highlighted two capabilities Situational: Awareness (SA) and ballistic protection being pursued by Warrior 2020 which has adopted NATO’s five capability areas: Lethality, Survivability, C4I, Mobility and Sustainability. The programme began in 2004 by analyzing the capability gaps and then the requirements for the future. The programme is to begin procurement in 2014 and deliver an operational system in 2018-2020. “Mobility for a single soldier is more important than ballistic protection that is something we are working on to have the balance of capabilities,” commented Maj. Honkela. The current ballistic system is the Model 2005 system or M/05. It was introduced to service in 2005. The system includes excellent arctic clothing and systems for Special Forces soldier and the basic warfighter. Based on lessons learned from Afghanistan, the system has been adapted with new items adding weight. These include the new M/2010 new Modular Carry System and Bullet proof vest, active hearing protection headset, eye protection, Image Intensification Goggles, ID systems, IR light and BMS computer. The SAWUI or Supporting situational Awareness through Wearable multimodal User Interfaces study took place from 2008-10 and was divided into five work packages: Requirements, Development and Integration of Demonstrator, Concept Study Field Tests, Multimodal User Interfaces and Supporting SA and Decision making Process. These addressed the utility of a number of issues such as haptic or acoustic interfaces and navigational analysis including how stress affects soldiers. SAWUI’s main conclusions concerning wearable user interfaces included the need to be tailored for different roles with information having to be represented in an intuitive and non technical way familiar to soldiers and while individual soldiers can conduct their main tasks using voice communications and basic data such as an automatic emitter of PLI data, squad and platoon leaders need a user interface to plan the mission, aid navigation and to know where own troops are to receive and/or send the information regarding where the enemy is. Major Honkela explained that Finland’s approach is very much a squad as a system rather than soldier as a system. While squad structures for Light Infantry and MOUT units will remain based around a seven man sub-unit, in Light Infantry squads, numbers are planned to rise from seven to nine, with trials of this having begun in October. The TP2010 Warrior Technology programme is divided into four studies: Integration and new Energy Solution led by Savox, C4I/C2I For Future Squad and Platoons with Ista to produce a prototype system based on comparative studies of existing systems, Sensor Fusion and Target Acquisition led by Millog which will address weapon sight based on sensor fusion implementing a Day Sight, I2, removable Thermal Sight and Laser Range Finder with the sight also functioning as a soldier user interface. Last is Communications, by using COTS Solutions led by EXFO and NetHawk addressing how to use cell phones for communications, messaging and navigation including creating a local/aerial network by using mobile base stations. Major Honkela noted that in testing, troops were given no training in how to use the cellular phones and apps with individuals immediately understanding how to use the devices. For work on improving ballistic protection, the TP 2010 SP Survivability study is looking at the use of new light weight hybrid structures such as fibre, ceramic and metal based materials. For the fibre based protection panel, the minimum protection against fragmentation is EN 1522 class FB1=PM1 (.22 lr) with a maximum weight of 2kg/m2. Requirements for Ceramic/fibre based ballistic protection is NIJ 0101.4 Standard Level IV (7.62x51 NATO AP P80-bullet) with optional performance to Level IV+ 7.62x51 NATO AP/WC- core bullet with Light Weight solutions and a Multi hit capability being pursued. Included in the study is the potential use of nationally sourced innovative materials including Exote armour. Another effort in the area of improving ballistic protection is Project Helmet System 2020 with Phase 1 beginning in the Summer and lasting until 2012. The Helmet is being addressed as a platform within a modular concept. Features include adjustable protection levels impacting weight, integrated communication system, integrated Night Vision system with a new light weight I2 system with 60 degree FOV and integrated ear and eye protection. Prototypes for field tests take place in late 2012. As part of TP2012 Study 1, Savox examined a number of options on how to save weight with total savings of 4.6kg having been found. These include 400g from the helmet subsystems with the use of lighter materials and a reduction in the weight over legacy NVG of 150g. Another major area of weight savings is combat gear and ballistic protection at 2kg with new clothing delivering a further 700g saving. However the move to adopting a future soldier system also brings with it additional weight penalties; these including an extra 600g for batteries, 400g for wiring and sensors, 200g for PDA and 400g for an integrated sight; in total 1.6kg, resulting in an overall saving of 3kg. Other activities designed to save weight include modularity and the possibility to tailor the system based on task. Major Matti Honkela was speaking at Soldier Technology 2011.